last fall, when we started "exploring" the backyard of our new home, we discovered a hole below the liriope that rings an oak tree. the liriope ring has apparently been around the tree for several years and has built up about six inches above the level of the yard. the hole was (is) two or three inches in diameter, of indeterminate depth (*i'm* not about to stick my fingers in there!) and sheltered by the liriope. yesterday afternoon i happened to reach down in front of the hole to pick up some tree debris and noticed what looked like a brown leaf in the hole. looking more closely i realized that it was, in fact, a large-ish toad. i'll try to remember to look this afternoon and see whether he's still there. not surprisingly, texas (and houston) is home to all sorts of frogs and toads. 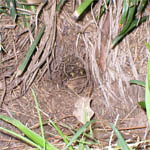 my (somewhat uneducated) guess is that the aforementioned toad is either a gulf coast toad or a woodhouse's toad. it would be neat if it were a houston toad, but that seems unlikely given its endangered status. 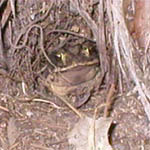 gardeners who wish to encourage toads can help them out by creating a toad shelter. Get Donkey! Garden. fellow h-town blogger get donkey! has gotten the garden bug. he even has pictures documenting his success. i have four more gardenia cuttings in water, even though i have two successful gardenia rooting experiments in pots. Insect Identification. the texas cooperative extension's common insects of texas image archive helped me identify the large milkweed bug. Large Milkweed Bug. recently, i've noticed several of these black and orange bugs on the milkweed. i think they look scary, but apparently they are more-or-less harmless. Building a Raised Bed. it won't win any design awards, but i built a raised, brick vegetable / herb bed this weekend. it's about 10' x 3' and 10 inches (4 bricks) deep. before starting, i covered the ground with all the newspapers we had (about one week's worth). after i built up the walls, i filled it with mostly-done compost. sometime in the next few months i'll buy a couple of bags of soil to dump on top. Mexican Heather Cuttings. this afternoon i potted 14 of the cuttings that had been rooting in water. yes, fourteen. i left three more cuttings in the water. they had roots, but not as many as the other cuttings. i've concluded that mexican heather is incredibly easy to root. i don't do anything special to the cuttings - just stick them in plain tap water and set in the window sill. replenish water as needed. Green Anole. found this one lurking in the plumbago. i spotted a total of five anoles in the backyard - two grown females and three youngsters. i also saw a couple of skinks, but i wasn't quick enough with the camera to get pictures of them. Rain, Rain, Go Away. i know i shouldn't complain about rain in august - especially not here in texas - but we've had about four more inches since sunday. we are now comfortable with the drainage of our property as we have had no problems with rising water, even though the ground in our neighborhood is saturated. hopefully the ground will dry out enough today that we can mow the grass this weekend. i don't care so much about the height of the grass, but i want the clippings for my compost.